If you have spent any time with more than a handful of wireless channels, you know that RF Coordination is key for a stable wireless system. 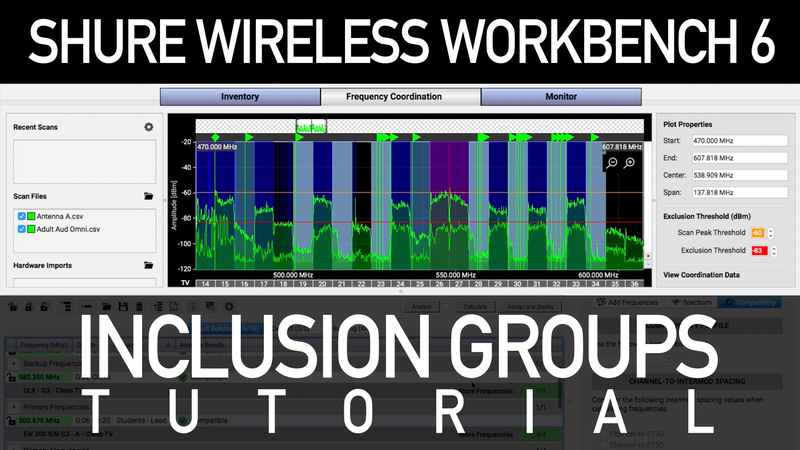 I wanted to share a bit on a feature inside of Shure Wireless Workbench 6 called Inclusion Groups. 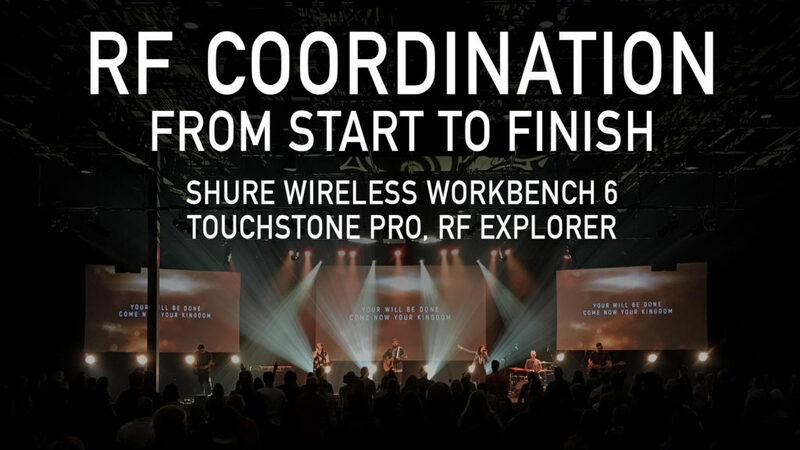 For those of you who have not used Shure Wireless Workbench 6 before, I have a blog post HERE where I walked through an entire RF coordination from start to finish. Make sure to check that out if you haven’t already! 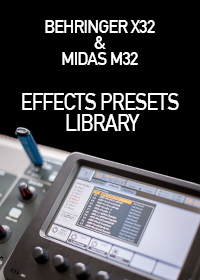 Click on the ‘Frequency Coordination’ tab. 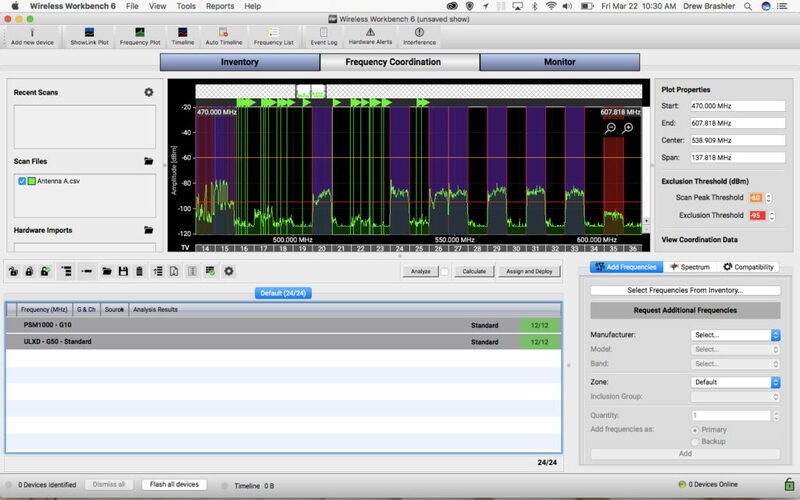 Typically, the way we use Shure Wireless Workbench 6 (WWB6) is by excluding TV station channels or portions of the band that have higher RF noise level. Inclusion Groups work the opposite way – we are telling WWB6 to only place an item in a specific frequency that we dictate. One way we can use Inclusion Groups is to separate two types of RF gear with a ‘guard band gap’ which is a fancy name for a space of RF in between two groups of frequencies. The benefit of a guard band is that it can reduce the effects of IMD by providing space between two sets of RF frequencies. We can see that there is a little more RF on channels 16-19, and we can provide a guard band gap in television channel 20. I have made two inclusion groups here, Inclusion Group ‘ULXD’s’ is between 482-506 MHz and Inclusion Group ‘PSM1000’s’ is between 512-542 MHz. After I apply this to my 12 channels of ULXD and 12 channels of PSM1000, it will force WWB6 to only place the ULXD between 482-506 MHz, and force WWB6 to only place the PSM1000 between 512-542MHz. 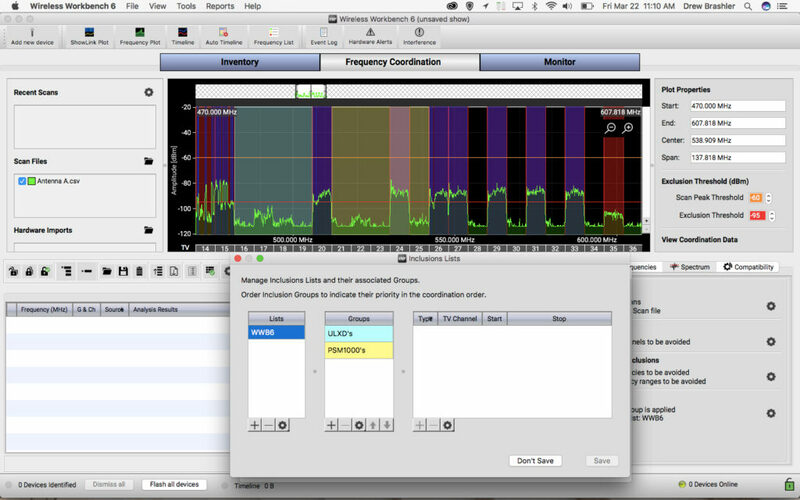 The primary use of Inclusion Groups in Wireless Workbench 6 is specifying clean/empty tv channel spaces and tv channel spaces that have very low power stations that would only add a minimal amount of RF noise. With the auction of the 600 MHz band for various uses, all of the television stations who were previously in the 600 band, now have moved down to the 470-608 MHz spectrum. This means our spectrum is becoming more and more congested. I have created a YouTube video explaining my use of Inclusion Groups, so check it out here: Shure Wireless Workbench 6 Tutorial – Inclusion Groups. I like to call my two inclusion groups ‘Clean TV’ and ‘Dirty TV’. Clean TV: My Clean TV inclusion group contains TV channels which are completely void of television stations. In the past, the FCC regulates at least two stations are kept clear in every major area of the country. You are likely to find a handful of empty channels depending on how you have your antennas pointed. Dirty TV: My Dirty TV inclusion group contains all of the TV channels from the Clean TV inclusion group, but then I will also add in channels that have low power TV stations currently transmitting. This would often be below the -85 dBm threshold point inside of WWB6 (the red line). Placing wireless here would still have a sufficient signal to noise ratio to pass audio dropout free. Using these two inclusion groups, I will specify inside of WWB6 what items are my critical, show-stopping, wireless items. The critical items will be in the Clean TV inclusion group. Then I will specify my non-critical items, still very important, however not show-stopping if they have a little bit of interference. These non-critical items will be put into the Dirty TV inclusion group. Remember that the Dirty TV is underneath the -85 dBm threshold inside of WWB6. Wireless Workbench would have still placed wireless in these areas and chances are you will have NO issues with having RF placed here, but this process of the Dirty TV vs Clean TV ensures that your critical items are placed in a noise-free television channel. This makes those channels even more robust with the lowest noise floor possible in the coordination. 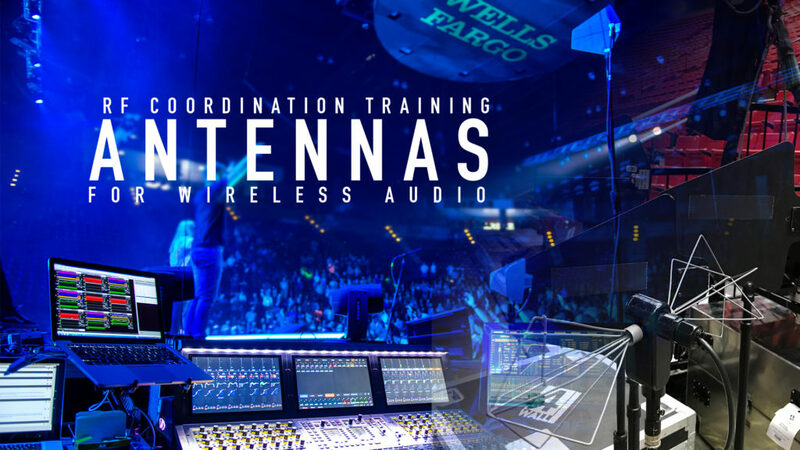 Looking for more training on RF Coordination? Check out my blog post on Antennas for Wireless Audio.